A visit to Celadon Beach Resort in beautiful Panama City Beach can be an idyllic and memorable vacation experience. 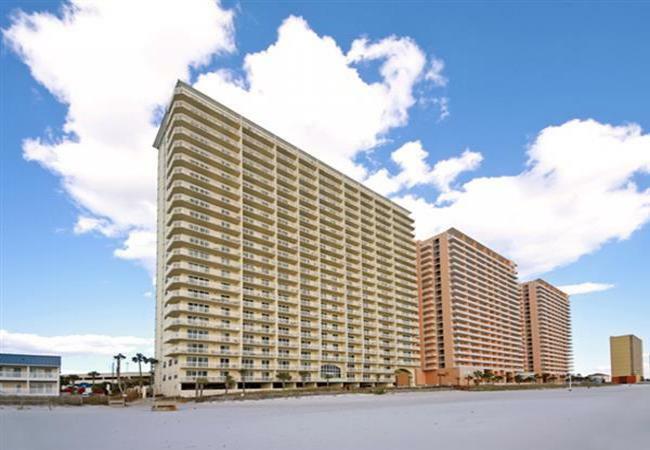 If you’re weighing your options in Panama City Beach vacation rentals, this airy and bright 22-story resort may be ideal for you. It’s equipped with many exciting and convenient features. These include an exercise center, tennis courts and even an outdoor/indoor swimming pool. Celadon Resort has a convenient location on Panama City Beach’s west end. It’s near both Pier Park and Frank Brown Park. Pier Park is a large shopping center and Frank Brown Park is a wonderful destination for people who are interested in recreational activities. It spans a total of 200 acres. If you want to go on an amazing trip with your family, there’s no finer place to stay in the area than Celadon Resort. If you want to savor fantastic Gulf of Mexico sights, this resort can make it happen for you. If you want to enjoy a stay in a peaceful and quaint area, you’ll appreciate the serene West End surroundings as well. This resort is a great option for people who want to do whatever they can to stay away from excessive noise and action. The resort is merely steps away from the gorgeous beaches of the area. If you’d love nothing more than to go for a walk on sugary and smooth pale sands, Celadon Beach Resort can cater to your wish. The resort makes a great lodging option for all types of visitors to Panama City Beach. If you’re the type of person who loves lounging around in a luxurious guest unit, you’ll have a blast spending time in your spacious condominium rental. These Panama City Beach vacation rentals are roomy, contemporary, airy and just plain ideal for people who are serious about pure relaxation and comfort. If you want to stay in a Panama City Beach rental that can make you feel as comfortable as you do while at home, Celadon can take care of you. The resort is equipped with it all. If you want to experience the soothing and majestic beach getaway of a lifetime, this resort is indeed for you. The guest units that are available at this resort all come with large living rooms and balconies. If you want to step out on a balcony and relish the wondrous beauty of the Gulf of Mexico, this resort is definitely the place to do so. You can even gaze at spirited dolphins frolicking inside of the mesmerizing and enchanting waters. If you’re a fan of bright green H20 and seemingly endless skies, this resort should be the backdrop to your next warm and sunny Florida vacation. Although this resort is the picture of sun-kissed relaxation and serenity, it’s extremely close to an abundance of modern conveniences in the area. If you want to be a brief drive away from a good number of reputable dining establishments and shops in the lovely northwestern Florida city, this resort is optimal.